Casi Cielo whole bean coffee returns to Starbucks on January 12, 2010! This annual seasonal offering was first created by Starbucks for the Seattle restaurant, Canlis, and other fine dining establishments. Introduced and unveiled officially in October 2004, this blend is now in its fifth year. It is only offered in Starbucks stores during the Winter season each year, and it’s an amazing blend of Latin American beans with a medium body to it. Canlis, a luxurious dining experience, offers its customers Casi Cielo coffee year-round, and I’ve frequently been told that Canlis has a Clover brewer too. This coffee was blended to be experienced with fine dining, whether through a Clover, in a press, or drip-brewed. The beans come from four farms in the Antigua region of Guatemala, and the beans are grown at altitudes above 5000 feet. The Antigua Valley is arguably the most world-renowned area in the world for quality coffee production and it is surrounded by three volcanoes (Agua, Acatenango, and Fuego). Two of the farms that continually produced beans for Casi Cielo have medical facilities on them built by Starbucks funding. (Finca San Miguel and Finca Santa Clara). My own love affair with Casi Cielo was solidified in January 2008. On a Winter’s day in Seattle, I stepped into the Starbucks store number 3289 at 6th and Union in downtown Seattle. By good luck, I found the Clover brewer, and my very first cup of coffee brewed on a Clover was a tall cup of Casi Cielo. I loved it. That was it. Hook, line, and sinker, Casi Cielo and the Clover had me. The Canlis website boasts that this is Starbucks’ second most popular whole bean coffee, following only Christmas Blend! A little known fact about Casi Cielo is that Starbucks does roast a very small quantity of decaf Casi Cielo coffee for Canlis and a handful of other restaurants only. Decaf Casi Cielo is not available at Starbucks stores. Just for fun, in this blog entry I am including a YouTube video produced by the legendary Jason Coffee of Coffee Cup News – In this video he is doing a tasting of a 2009 bag of Casi Cielo: Enjoy your Casi Cielo!! Thanks for the history. 😀 I will be going to Starbucks today. Have you ever been to Canlis? I’ve fallen out of love with Starbucks coffees (the actual coffees, not the lattes), but I’m going to try to get out and make it a point to try this one. @Mike – this one is absolutely worth a try. I like to give it as a gift this time of year (no Clovers in Chicago Starbucks, Melody so no limited editions). Your post has convinced me to try it, I’m heading out to starbucks now and hopefully they are brewing it, if not I’ll buy a bag. Did you write anything on this years Thanksgiving blend? I gave it a try and now I’m missing it big time would love to know the history behind this years mix. thanks for a great blog! I was surprised by how acidic it was this year. Still delicious, though. It’s always weird to me when Casi Cielo is our “pick of the day” because that means we don’t have a definitive bold option in the morning. Four other baristas and I post funnyish videos every weekday on youtube in which we talk about coffee and Starbucks. Today I did a quick tasting of Casi Cielo. Check it out if it sounds interesting! Cam, links about more coffee education and Starbucks are fine! I’m dying to try this one. Thanks to your post, I’m going to have to go get a pound. Do you know how long Starbucks is going to have it for? @CoffeeVanilla I believe Starbucks will have it till mid March. Camspi – Great! Which means I’ll have time to finish the rest of my Christmas Blend! I really hope my Starbucks offers a taste test today. Anytime sometime new comes out they usually do. I like the video blog about the coffee. I may have to purchase a pound just based on his review. (Sorry Starbucks can’t pay you for the recommendation but they should 😉 ) I’ll check it out once I get off work in a bit. Hi VerlTodd! I think lots of stores are brewing Casi Cielo right now. I was just at my local store over the lunch hour, and I’m drinking Casi Cielo right now. Check at your local Starbucks – I think it might be more likely to find it before noon, but that’s pretty unpredictable. Interesting Starbucks experience in Mission Viejo, CA, today. First of all, this store actually offered a “bold” alternative to Pike Place — Sumatra. A very encouraging sign. Secondly, I saw a guy order an espresso topped with whipped cream. Then he put raw sugar on top of that. He said the cream filters the espresso as he drinks it, making it makes a more “consistent” cappuccino. Hmm, maybe I’ll try it — sans the added sugar. Hmmm… never really was one of my favorites, Casi Cielo. Camspi – great video! I say wear a tie (maybe I’m influenced too much by Barney in HIMYM). I’m a big fan of Green Ginger too – but I know very few who liked it. Well, after watching that, I’ll have to pick some up tomorrow! (reply to Venti_Bold) – Canlis is not in my budget! I’ve never been. I bought some this morning, I had tried a sample of it last year and thought it was so good. They also had their table of new snacks out, some of the snacks looked interesting. The teas looked good too. Just read your post on “Flair” — do you think Starbucks swag will turn out to be as collectible as old McDonalds and Coca Cola stuff is? I immeadiately bought a bag just to see what all the news was about. I’m heating up water right now to french press it. I will report on my findings. Starbucks owes you that sale Mel! They really should be paying you, but then could we really trust the authenticity? It says a lot for the coffee and the info that you do this without being paid! Same here, Kelly, I also bought a bag due to what I read here. Will have it tomorrow morning, too late for coffee now. (Or is it ever too late?). Melody, how much does a meal cost at Canlis? Do you know how much a french press or a cup of Casi Cielo would be priced there? I’ll bet this coffee is really big on campuses too. Your description makes me want to try it. And I might! Well, this has nothing to do with this coffee but wanted to post this and maybe you can put it…wherever Melody…or start a thread about this, if this is wide-spread. I walked into my regular Sbux yesterday, first time in a couple days, and I thought I was in a 7-11, or some convenience store! First there’s an arrangment with all the new little ‘snack bags’, in bright colors. Looks nothing like it fits in with Sbux. Then, there’s now a whole section of a wall where brewing materials used to be displayed and it’s ALLLL VIA. One same small section of the wall has bags of beans, which we all know has been greatly reduced. Then there’s a basket with the ‘new recession-Valentine-bears’…..just bare bones like the Christmas ones were, which did not sell, at least at my store. ( so much for all that feedback on msi re: bearista bears!) There are bags of ‘Casi cielo’ sitting all arond the store, in odd places but very prominent. This is the first time I ever remember walking into any of my regular stores and thinkng: WOW! what happened??? Maybe this is just me, but wondering if anyone else has seen such change and finds it remarkable, not in a good “coffee” way. ??? Maybe I will start a thread about it on msi, but first would like to know who wide-spread this is. @LatteRose I should have waited till morning! I was too eager to try it and ended up buzzed when I was ready for bed! I realize that I have tried this coffee before. They have the (rare?) decaf version year round from the Clover at the Village Roadshow Gold Class Theater in Redmond. A Clover at a theater? I asked them about it and they said it was a special favor from Howard who apparently likes the fancy movie place. Don’t blame him, it’s nice. Haven’t seen the decaf Cielo anywhere else. @Camspi I was curious too so I looked at their menu online. Main courses at Canlis run $36 – $84. Don’t know what coffee costs. I wonder if they would let someone come in and just get a coffee at the bar? Oops, I guess it’s not a bar at Canlis, it’s a lounge. I definately need to try this coffee now. I’m discovering as I try the different blends I favor the Guatamalan Beans. So I tried the Cielo – very good! Another new favorite. Off to buy another bag or two as a gift. (Reply to Kelly and LatteRose) – Glad to hear you two liked Casi Cielo. It’s a seasonal favorite of mine. This year I was more than a little disappointed to see that Starbucks made almost no fanfare over one their most popular coffees. 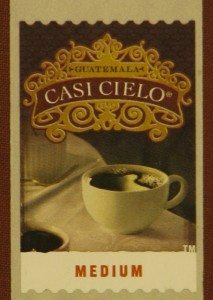 The blogs at MyStarbucksIdea.Com have focused on skinny lattes and foods and somehow Casi Cielo got forgotten. I feel like Starbucks should have had a blog post for their seasonal coffees, in a similar fashion to what I have done in this post. I love this coffee! It in my opinion is the best lighter roast coffee at Starbucks. One of my stores was brewing it today. I love to see Starbucks store partners abuzz with excitement about the return of a favorite coffee! I tried Casi Cielo once at Roy St and wasn’t that impressed by it, but maybe I’ll have it again in a Starbucks store if I see it available. My first impression was that the coffee seemed a little dull, not very acidic, lacking complexity, but sometimes I gradually grow to enjoy coffees I didn’t like before. Yum I had my first cup of this for the season yesterday, it was wonderful to have it back! This is my favorite blend and every year when it’s released I stock up. No sense drinking the swill they serve at the Daily Planet when my taste buds can dance and sing to a Canlis creation like Casi Cielo! Wow, this coffee sounds so good. I think that I will pick up a bag of it next time I am in there. This is a real neat blog! Welcome to the blog Heat Miser. The Casi Cielo coffee is a seasonal blend. That means it’s not yet at Starbucks. But you don’t have long to wait: This coffee returns January each year. I’m a little late to the game, but I found this blog after Googling “casi cielo.” They were offering this today instead of the bold option. I suppose I’m the only one here that’s not a big fan. It’s so very acidic–I can definitely taste the lemony tones–something I’m not accustomed to with coffee. i totally loveeeee it..casi cielo is not almost heaven..it is heaven..i buy as many 5 lb bags of whole beans as i can get from every star bucks i can find….bur grinder and a french press is totally heaven…:) cant wait to get it this year.. When is Casi Cielo coming out in 2012?